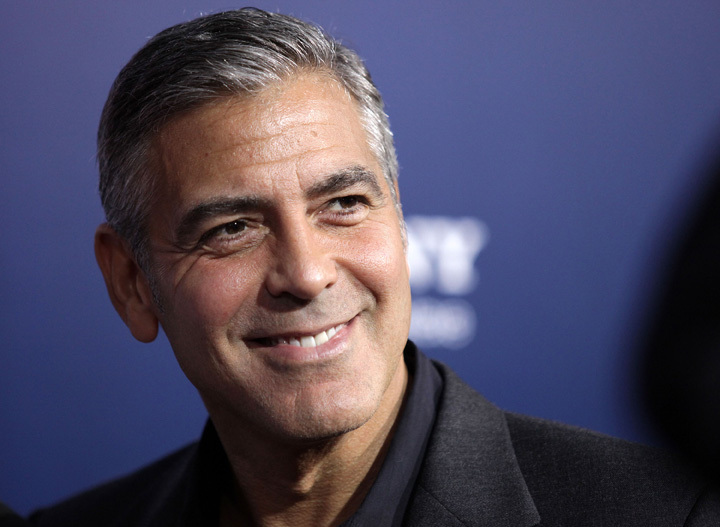 George Clooney is one lucky guy. And he knows it. A phenomenally successful career, a beautiful marriage to Amal and now, twins, Ella and Alexander. «It’s great,» he says of fatherhood. «It’s a time in my life that I didn’t think I would get to experience, so I’m a lucky man. How can one man be so lucky? With only a bare few moments to spare in his colossal trail of promotion for new film, «Suburbicon», I’m not anticipating an intimate one-to-one conversation.» More like a generic, film-focused chat with a slight, tiny peppering of personality. But one forgets just how well gorgeous George plays the game. Or maybe that’s just it – he doesn’t, he is just a genuinely charming, affable fellow. While chatting about his latest directorial effort based on racial tensions in 1950s Americana, he finds time to comment on segregation and bigotry in Trump’s US, the Harvey Weinstein scandal and his true feelings for leading man, Matt Damon. But the real joy in his velvety vocals comes from his new family. Barely five months old, the new father is a doting parent who takes pleasure in explaining the delights of diaper changes and midnight feedings. And at 56 years old, the star has never seemed happier. Warm and open, he reflects on an eventful year and the passage of his career. George and Amal live in Berkshire with their young twins. You’re a very popular guy. Julianne Moore has the nicest things to say about you. Isn’t she cool? Really, isn’t she the coolest, nicest person you could ever meet? She’s amazing. But Matt, I’ve read, seems to be the only one who’s had quite a lot of bad things to say about you. Matt, he’s the worst. What a nightmare. And he can’t even act to save his life (laughs). Because you wanted Brad Pitt didn’t you? He was busy and you know, Matt’s the cheaper option (laughs). You’re not going to get Tom Cruise for cheap, there’s budget to contend with. So, you get what you pay for (laughs). So you must have got a lot of glee from the punch scene? That’s why I tortured him. Probably the most enjoyment I’ve had, it’s somewhere in the top two per cent, of my professional career. And the truth is, I got it in the first take. But we went again twenty, thirty times, just because I could. And I’m not sorry. Not in the least. The subject matter, it’s eerily timely. Do you see that as a pro or a con? Well, it’s not timely if you think about it because racism has never gone away. It’s still very much a part of our every day and while it can appear to be pushed towards the back of consciousness temporarily, something like [Charlottesville] will propel that existence of hatred and bigotry back into the headlines and front pages. It’s never far beneath the surface unfortunately and it takes very little for it to rear its ugly head. I grew up in Kentucky, in a time when segregation and racism was a deep issue and I look back at it then of course attitudes and opinions have progressed in a big way. But there are still huge swathes of society who feel like they are losing their footing and their place in society and they’re blaming minorities for it. Sequences of the film «Suburbicon» with Julianne Moore and Matt Damon. © 2017 Paramount Pictures. All rights reserved. That’s because the administration has stoked the fire. Yes, the talk of building fences and dividing and isolating minorities, has been very present in recent times. But it’s nothing new. These conversations have been happening for a long time. And it was interesting for me to project that on a Fifties backdrop where the wide perception is a Leave it To Beaver, living the American Dream in Eisenhower’s booming economy. Scratch the surface, it wasn’t like that. It maybe was ifyou were a white man, that was it. I can’t talk to you and not bring up the furore engulfing Hollywood right now, what’s your take on what’s happening? It’s a watershed moment in history for two things; the overbearing fear of women not being believed. That has changed. Now the perpetrators, these men can and will be exposed for their crimes and no amount of silencing or intimidation or bullying will stop it. It’s not just a wakeup call for Hollywood, it’s a wakeup call for all industries and it’s a call for a society where women feel safe and feel secure discussing this subject. And where predators abusing these positions will be publicly shamed and brought to justice. The key here is to not let it fade away. It’s to actually build on the momentum and make a permanent change to how industry has operated for a long time. I also have to ask, how is fatherhood treating you? It’s really fun. They’re four and a half months old, they laugh at goofy faces and fart sounds, they’re the best audience I’ve ever had. Although now, we’ve just started them on solids, I think we’re at the precipice. I don’t think it’s going to be as fun (laughs). And I’m only relatively good with the diaper changing, but this new transition, is changing everything. For the worse. It’s all downhill from here. It’s a total train wreck. I’m not going to go into details (laughs). And I used to say to my friends, ‘what’s the problem, this diaper thing is easy!’ Yea, now I know (laughs). That’s what the nanny is for? No, it’s my job. What’s the point being a parent if you don’t get your hands dirty? That’s what it’s all about. What do you think has been your biggest surprise since becoming a father? I can’t really understand just how fully formed they are as human beings. Five months ago, they weren’t here and now, they’re both very different, he’s this little thug, this out there personality and she’s very sweet natured and dainty. And this is who they are, this is who they’re going to develop into and we as parents just have to try our best not to mess them up (laughs). I want them to be happy and healthy and safe and it’s our job to safeguard that as to be the best of our ability. And after that, it’s like rolling the dice. What are you most looking forward to? All of it. I am looking forward to their first word, talking and seeing what they come out with, that excites me. And how they’re going to talk back to me (laughs).